The skeleton of the unnamed carnivorous dinosaur. Beneath the metallic frame of the Eiffel Tower in Paris, the fossilized remains of an unknown species of dinosaur sold to an anonymous buyer earlier today for €2 million (USD $2.3 million). A group of scientists had tried to stop the sale, saying such an important scientific discovery shouldn’t fall to a private collector. 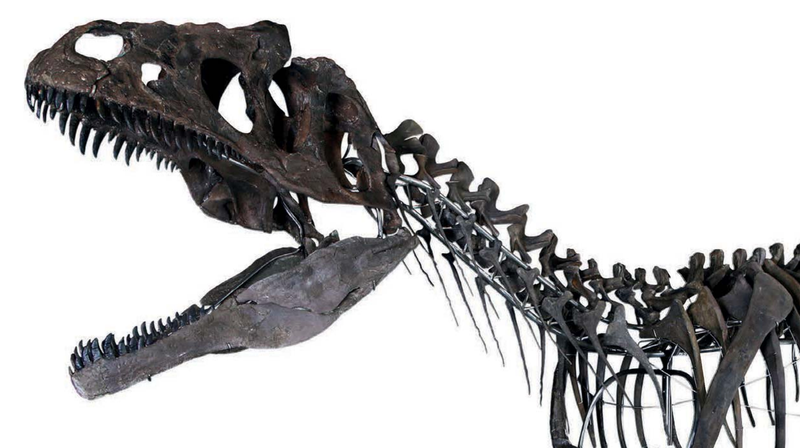 An unknown British businessman sold the remains of the unknown dinosaur to an unknown French fossil collector. During the auction, Japanese and Swedish phone bidders had pushed the price above the €1.8 million (USD $2.1 million) estimate, but the French collector finally prevailed with his €2 million (USD $2.33 million) bid, The Guardian reports. The large carnivorous dinosaur, likely some type of Allosaurus, was discovered in Wyoming in 2013. Not much is known about the specimen, as it was unearthed by an unnamed group of paleontologists—yet another unknown. The skeleton is nearly 29 feet long and about 70 percent complete. The creature lived between 151 to 156 million years ago during the Jurassic period, so it was a forerunner to the Tyrannosaurs, which didn’t appear until the Cretaceous. It features several key physical differences that set it apart from similar species, such as Allosaurus fragilis. scientifically important vertebrate fossils are part of our collective natural heritage and deserve to be held in public trust. Scientific practice demands that conclusions drawn from the fossils should be verifiable: scientists must be able to reexamine, re-measure, and reinterpret them (such reexamination can happen decades or even centuries after their discovery). Fossil specimens that are sold into private hands are lost to science. Even if the bones were made available to scientists, “information contained within privately owned specimens cannot be included in the scientific literature because the availability of the fossil material to other scientists cannot be guaranteed, and therefore verification of scientific claims... cannot be performed,” the SVC wrote in its letter. The group was also concerned by comments made by Eric Mickeler, an expert who oversaw the auction for Aguttes, who said the new owner would be able to name the new species. The SVC said this was a complete falsehood, and that the naming of the new species is governed by strict rules. Naming priority goes to the first validly published name, said the group, and not to the owner of the new specimen. “You will therefore understand our position when we strongly urge you to reconsider and cancel the sale of this important specimen,” the SVC letter concludes. Based on today’s sale, it’s clear Aguttes was unswayed by the letter. Hopefully the new owner will be as science-friendly as he’s claiming to be, the concerns of the SVP notwithstanding. It’s very sad to see fossils being auctioned off like art pieces, but this is apparently what happens now. Back in 2016, for example, the same auction house sold another Allosaurus, dubbed Kan, for €1.1 million (USD $1.29 million). Aguttes says it’s going to give some of the proceeds from the auction to charities working with endangered species. Smooth PR move, but it’s going to take a lot more than that to convince scientists (and the general public) that auctioning off rare fossils to private collectors is a good thing.